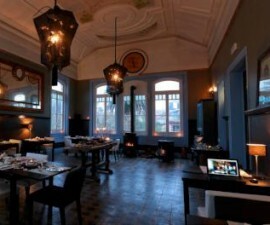 Restaurant Tasca do Chico in Sintra, Portugal, is a popular and well-known eatery serving a variety of traditional dishes from different areas of the country. 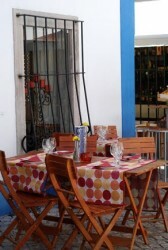 The Restaurant Tasca do Chico (or Tasca do Xico as it is spelled locally) is hidden away just off the main Praça da Republica up a narrow cobbled street – something of a gem in this quiet and unassuming location away from the hustle and bustle of the other town-centre cafés and restaurants. Despite Sintra’s popularity with tourists from all over the world, step over the threshold into Restaurant Tasca do Chico and you feel as though you have discovered exactly where the Portuguese eat. There is a lovely warm welcome from the staff – not always easy to find in busy touristy locations. That said, if any tourist destination is going to offer its visitors a warm welcome, Portugal will do so. The front of house team – David, Vanessa, Annabella – are happy to make suggestions from the menu to help diners get the most from their meal and provide a nice, natural level of service with a smile. Ask for a table outside if the weather is good – the perfect spot for a little people-watching over a tasty meal for two. The menu features a range of petiscos (tapas Portugal-style), a set lunch time menu and an a la carte menu which is popular with diners later in the evening. The portions are generous and the waiting staff is happy for guests to share the larger dishes on request. The fish of the day is a regular choice, often freshly caught locally off the coast of nearby Estoril and the Rice with gambas (prawns) is also a favourite amongst fish and seafood lovers. Other well-executed traditional Portuguese dishes include delicious black sausage with caramelised apple puree and of course the famous Bacalhau or cod dishes whose roots go back to the seafaring days of the great Portuguese explorers. 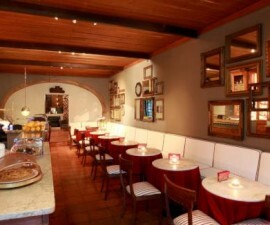 Booking is worthwhile at the Restaurant Tasca do Chico at night in high season, when live musicians often entertain the guests, adding a traditional feel to their meal. Prices vary depending on time of day and whether you opt for “tapas-style” dining, a la carte or the very reasonably priced daily set menu. Most major cards are accepted.